These awards, my second one, to be exact have been passed over by Priya Mahadevan of NOW SERVING ... Thank you Priya! Please do visit her blog for some exiting recipes. She is not only an accomplished cook but also a excellent dancer, yoga teacher and a journalist!! I am thrilled to bits! I have met here, wonderful cooks, nay chefs here in this virtual world, masters par excellence not just cooking but in other fields also. And being appreciated by such an accomplished person is an accomplishment!! 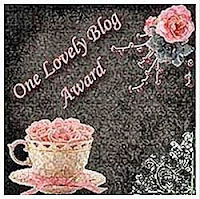 I am told that I have to share this award with 15 blogger friends that I have. That I suppose is the catch. I am facing the same dilemma as Priya who to leave out? Its like you have a party and leave out half your friends. I hope you understand that in my own clumsy way I am trying to apologise the ones I have left out. Its not intentional just the "Houseful" board came up before it was meant to. Before I add the names of the ones I would like to pass these awards to I am to share 7 things about myself. 1. My favourite celebrity chefs are Anjum Anand, Sanjeev Kapoor, Nigella Lawson! 3.Of course I love old Hindi movie songs, once that my daughters call "yucks" and Manna Dey is my favourite singer. 4. I love sweets, romantic novels. 5.My favourite colour is pink. 6. I have to remind myself that I graduated in Chemistry. 7. Last but most importantly husband is my best critic and friend!! Now for the most difficult part 15 people to pass these awards too. First of all, congrats on your awards and secondly, sure dear, you can host Nov 2011 for my event. Let me know which veggie you would like to choose. congrats on ur awards.you have a nice blog.you can visit my blog and give ur valuable comments. Congrats on ur award, glad to know more about u Archana,thanks for sharing with me dear..
congrats on ur awards..May u get many more! Whenever any channel is showing hrikesh mukherjee's movie, I watch it with the same enthusiasm. And Manna dey is my fav too. he has left some great songs for us. Thanks archana for passing on the awards to me. I am really touched. It is nice to know about you. Archana! Thank you so much for passing the great award on to me, I'm honored. And I loved the fun little tidbits about you =) Have a wonderful day! Congratulations on the award Archana and thanks so much for passing it on to me!!! Archana.. .Thank you so much.. I am so honored and humbled with this lovely gesture.. Truly appreciate this. This is a real motivation for me. Love..
Hey I am sooooooo sorry not coming over to collect the award...Thanx dear for passing it on to me!....lovely collection of recipes...following u!